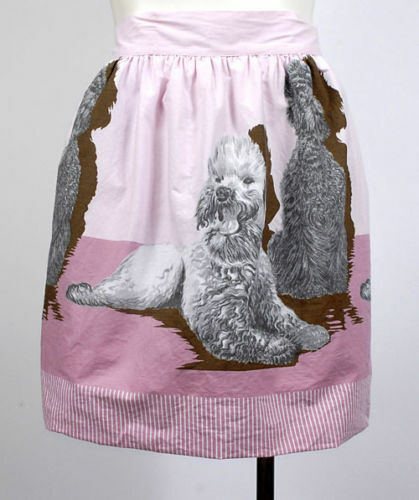 While shopping recently I spotted this 1950s poodle novelty print apron. I’d seen the print several times before, mainly on a facebook page that is devoted to vintage novelty prints. I snapped a shot for Instagram, and then forgot about it. Then a couple of days later, Susan at NorthStar Vintage found the same print but in pink. It got me to thinking about how common a practice it was for companies to offer prints in different colorways. So I took to the internet in search of more poodles on different colored backgrounds. The brown and tan version above is for sale at Heartbreaking. What made her listing so great was that a shot of the selvage was included in the description. 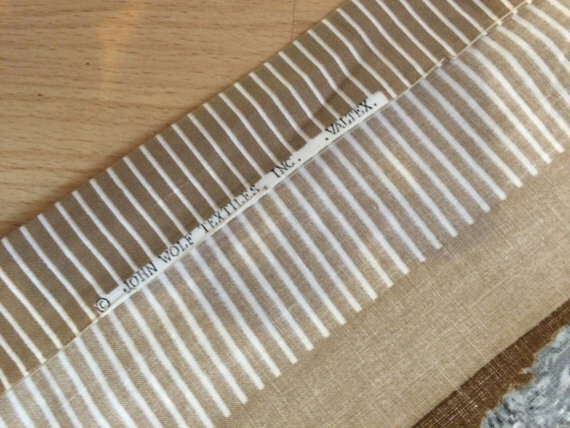 John Wolf Textiles was registered for business in 1946 as a maker of home decorating fabrics. The prints were perfect for curtains in a child’s room or kitchen, and were also intended for use as aprons. But they were also used in clothing, and today gathered and pleated skirts are highly prized by collectors. As was often the case, the fabrics were available to home sewers and to commercial clothing manufacturers. The prints were not exclusive to any one maker. 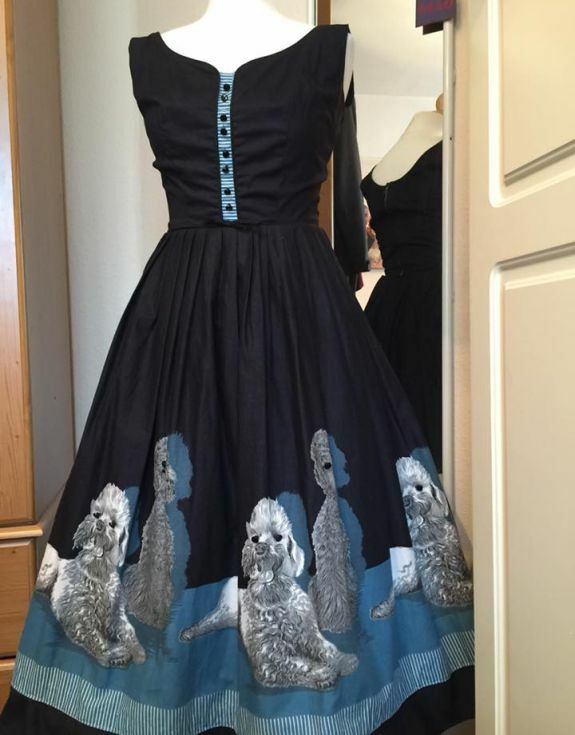 This dress (for trade on Facebook by Leslie Coward) with the poodles on blue and black was a manufactured item. Note how a bit of the stripe accents the bodice. Also note there is a band of black at the hem that was added. 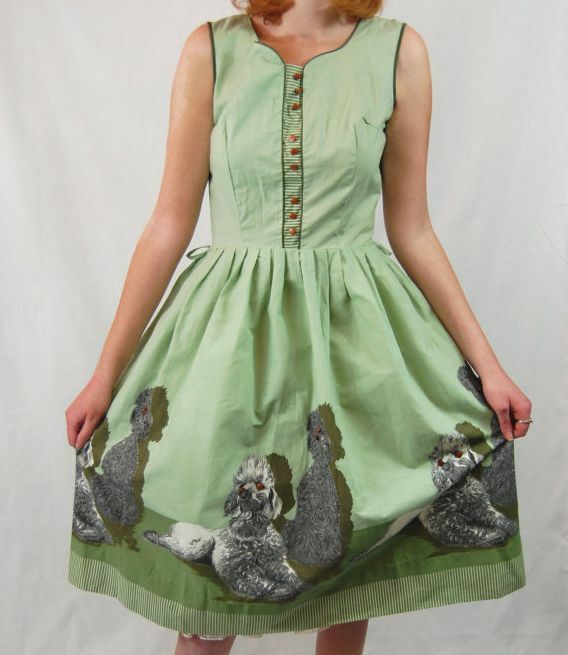 And here is the identical dress in green, which has been sold, but was in the FrocksnFrills shop. This dress was sold by JC Penney, under their Brentwood label. 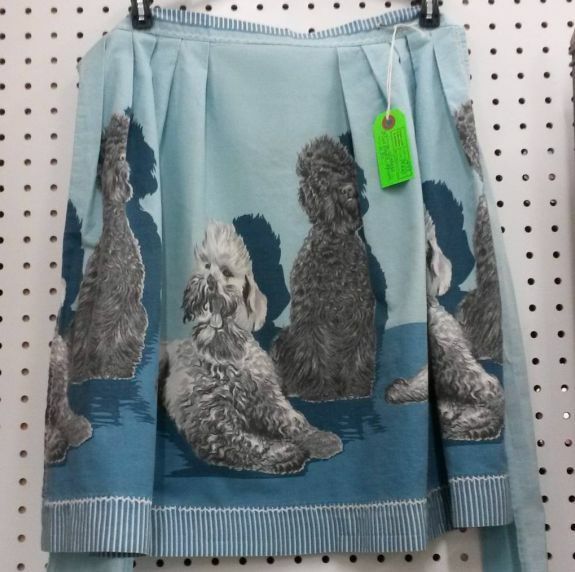 The poodles have buttons for eyes, and you can just barely tell that the black and blue version sold by Sears also have buttons for eyes, as does the one sold at Lana Lobell. According to the Lana Lobell catalog copy, they sold the dress in black/blue, brown/tan, and mint/dark green. I just find it interesting that the identical dress with different labels could be purchased in at least three places. Although this print is not an exact match, I think it is close enough to be included here. The poses of the dogs are identical in both prints, but the dogs playing dress-up are a bit less poodley. Still, I think it shows how ideas evolved and changed, or perhaps, how ideas were “borrowed”. 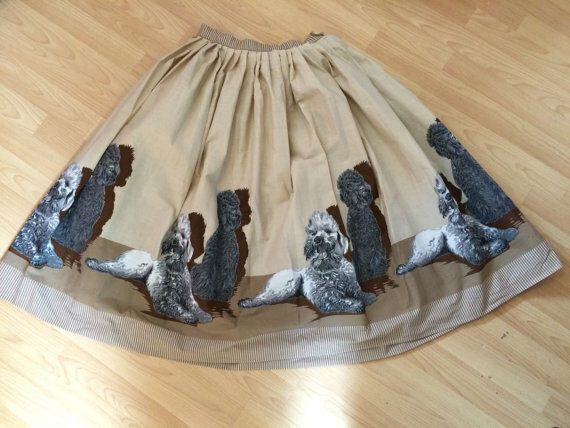 This skirt was sold by Cheshire Vintage. The facebook group I referred to, Novelty And Border Print B/S/T, is a great one to be involved in if you like novelty prints, or if you just want to learn more about them. People in the group are very knowledgeable, and someone is always posting a new find from a catalog to help document a print. If anyone reading has this print in a different colorway, I’d love to show it off along with the others. Edited for addition of photo. I recently had the good fortune to be contacted by Jeff Fihn, who found me by way of the Vintage Fashion Guild Label Resource. He was looking up the business with which his grandfather, Joseph Glaser, was co-owner. This dress business was Minx Modes. 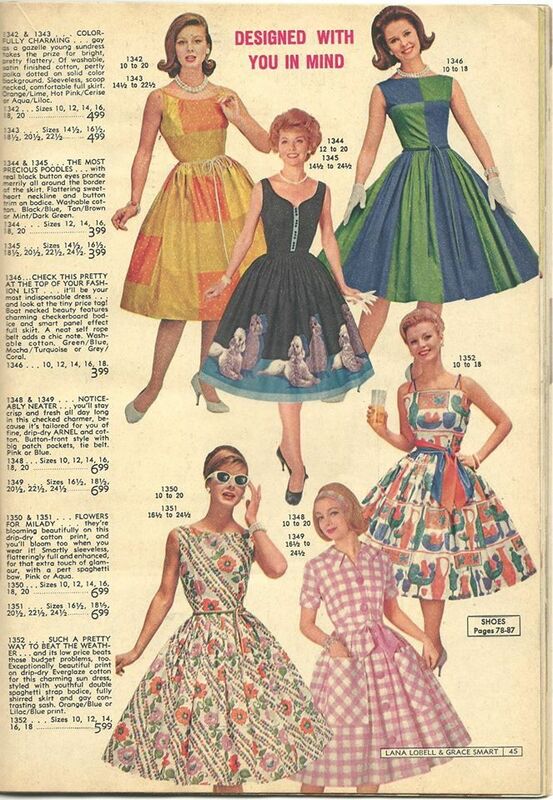 Minx Modes was part of the Saint Louis junior dress industry. What turned out to be even more interesting was that Jeff’s grandmother, Corinne Fuller Glaser, owned another of the great Saint Louis junior dress houses, Carlye. 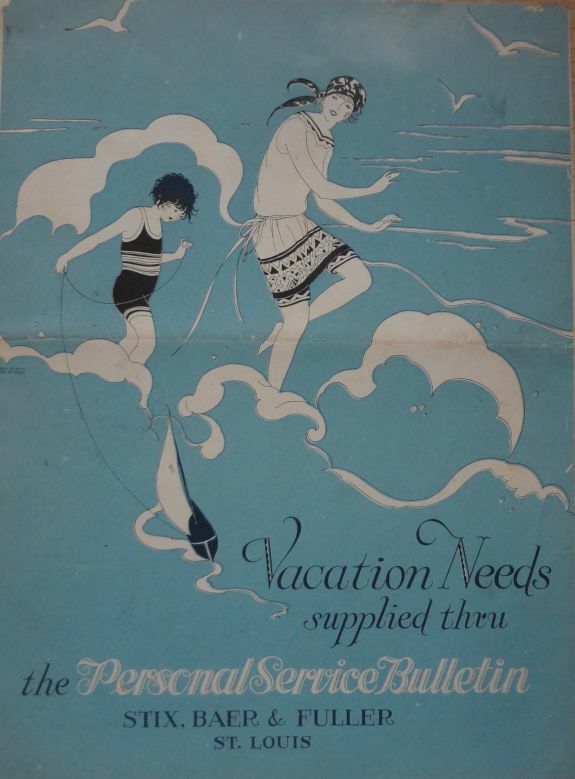 And the story does not end there, because Corinne’s father, Aaron Fuller, was a partner in the famous Saint Louis department store, Stix, Baer and Fuller. In Jeff’s email he asked if I’d like to talk with him about his family’s businesses. Yes, I believe I would! And so earlier this week I had a most enlightening chat with Jeff. Jeff’s great grandfather, Aaron Fuller was one of the founders of Stix, Baer and Fuller. Fuller had been a peddler in Pine Bluff, Arkansas, eventually owning a business called The Boston Store. By the 1890s he was in Saint Louis and in business with Charles Stix and the Baer brothers. The store was originally called The Grand Leader, and true to the name, it was a style leader in the Saint Louis area. Stix, Baer and Fuller was often referred to as SBF. The company used that abbreviation to its advantage with their Christmas slogan: Santa’s Best Friend. Jeff recalled that when he was a little boy the holidays were exciting because the children in the owners’ families got to go into the store and choose a present for themselves. Jeff mentioned the huge effect that the rise of discount stores had on the old, family owned department stores. Department stores were used to having sales at the end of a season, such as after Christmas, or for Back-to-School. The seemingly perpetual sales put on by stores like K-mart signaled the end of the independent department store. SBF was sold to Associated Dry Goods in 1966, and eventually was rebranded as a Dillard’s store. 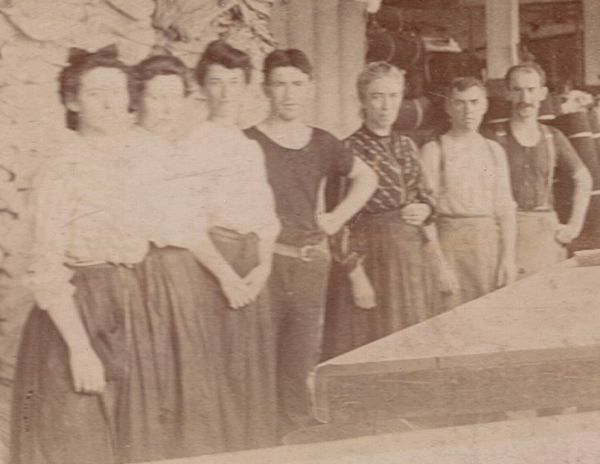 Aaron Fuller’s daughter, Corinne Fuller Glaser, was born into the retail business, and she kept her hand in it with a store for children’s clothes, Wyndotte. But her biggest business concern was as the owner of Carlye. Founded in 1938, Carlye was one of the many manufacturers of junior dresses in the Saint Louis area. 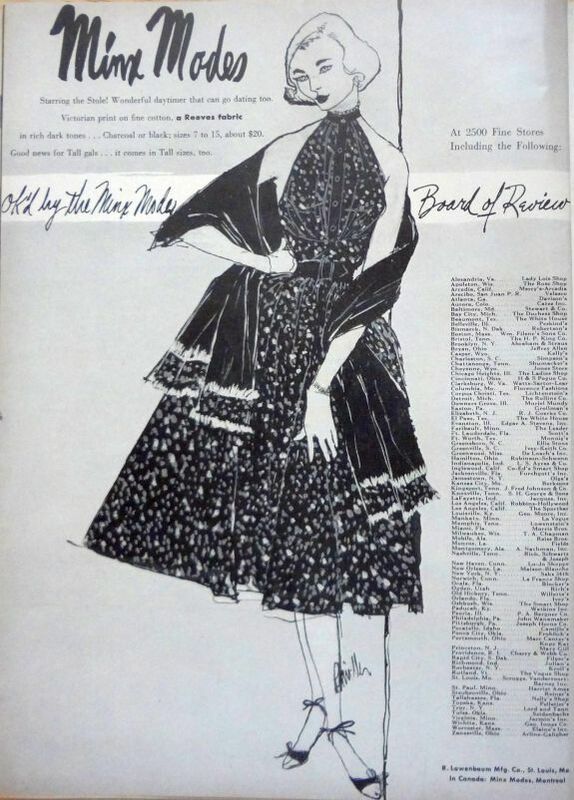 It was a bit more up-scale than many of the other makers, and you can see in my ad from 1957, that this dress was priced at $40 (about $340 today). Some time in the mid 1960s, Carlye was sold to Leslie Fay. One of my questions for Jeff was about the set up of manufacturing. 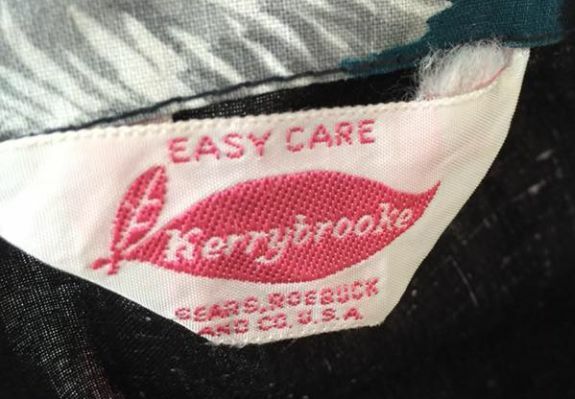 With so much of today’s clothing manufacturing being contracted and sub-contracted, it was interesting to learn that Carlye actually owned the factory where the clothes were made. In fact, Jeff worked there as a young man, spreading the long lengths of fabric on the huge cutting tables in preparation for the cutters. Jeff talked about how proud he is of his grandmother, and it is easy to see why. She not only ran Wyndotte and Carlye, she had and reared her two children, and then helped rear her grandson. She was very interested in the arts, especially the Saint Louis Symphony Orchestra. Jeff has recently learned that during World War II, she assisted relatives still in Europe to escape from the Nazis. Minx Modes made dresses for young career women. 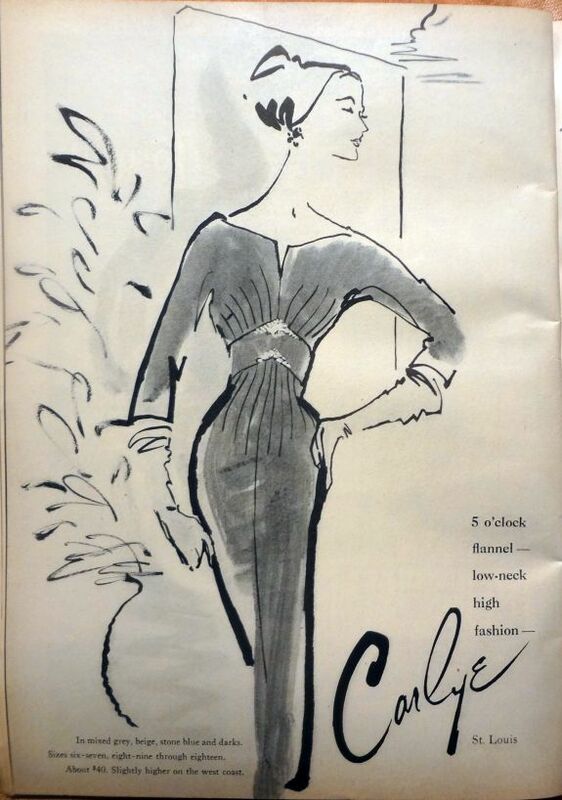 The 1954 ad above shows a dress priced at $20, half the price of a Carlye frock. At some time Joseph Glaser attempted to form a Saint Louis Designer’s group, but it never materialized. Their manufacturing took place, as Jeff remembers it, in Tennessee, but he did not know if R.J. Lowenbaum actually owned the factory. Minx Modes closed sometime in the late 1960s, around the same time that Carlye was sold. But what is really interesting is that Joseph Glaser made a recording of the history of Minx Modes. Jeff is going to have it transcribed or made into a digital recording, and he has promised me a copy when that is complete. So hopefully we’ll have an update with even more information about Minx Modes. My thanks to Jeff Fihn for sharing his memories about the Saint Louis fashion industry. I know that looking up while visiting a big city labels one as a country bumpkin, but when looking for traces of the past, it pays to risk one’s sophisticated image. The Lombardy Frocks building was located in the heart of New York City’s Garment District, on West 37th Street. 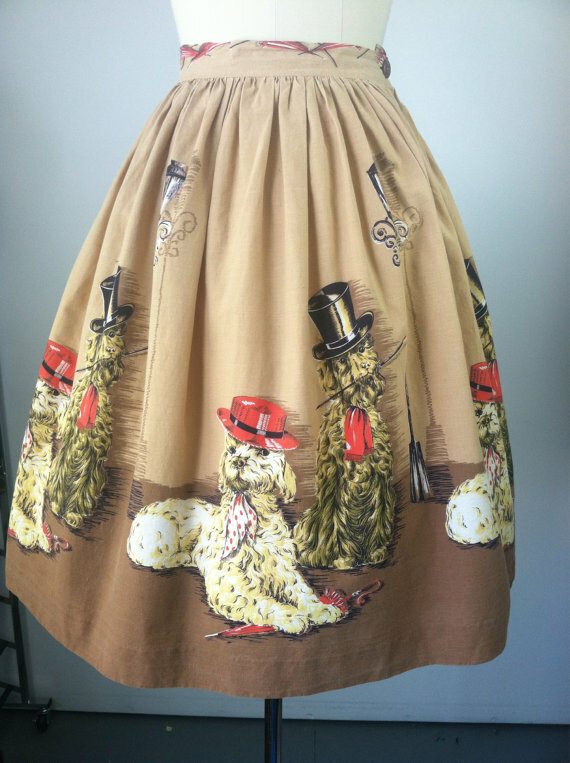 Lombardy was the maker of both Suzy Perette and Gigi Young dresses. The sign is a reminder of the important activity that was taking place all over this area of Manhattan. The garment-making industry in New York goes back to the 19th century, but the Garment District as we know it today was built primarily in the first three decades of the 20th century. The area had been a poor residential area, but in the early years of the 20th century garment makers began buying up the old apartments, tearing them down, and replacing them with high-rise factory buildings. The building that came to house Lombardy Frocks in 1949 was originally the Noxall Waist & Dress Company. You can see what is left of that sign below the Lombardy Dresses one. 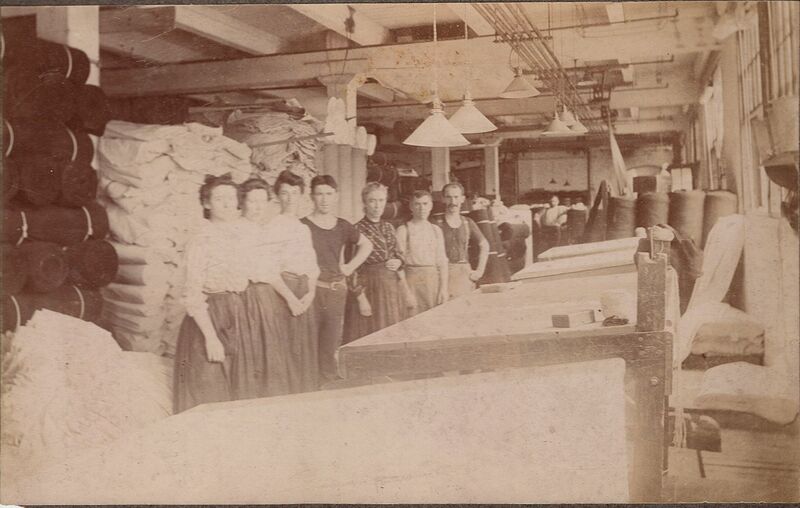 It’s a bit hard to imagine this building housing workers at cutting tables and sewing machines, but the large windows that let in the natural light must have seemed very modern to workers, many of whom had worked in sweatshop conditions in older buildings downtown. Lombardy Dresses and Suzy Perette were owned by the Blauner family. The “Perette Silhoutte” was based on the New Look of Christian Dior. The Blauners would travel to Paris to buy the right to reproduce Dior models each season. The Suzy Perette matchbook was a lucky find from my friend Tiffany of Pinkyagogo Vintage. You can see the same logo that is on the sign, and if you look carefully and squint a bit, you can see the words the “perette” silhouette under the dress on the sign. “the perette silhouette”… The shape that’s sweeping the country…Created with a revolutionary new method of construction, employing intricate gores and clever detailing which moulds your body into a flattering long torso line with a billowing skirt below. And here is an example of a Suzy Perette dress, on the cover of the December, 1953 issue of Glamour magazine. 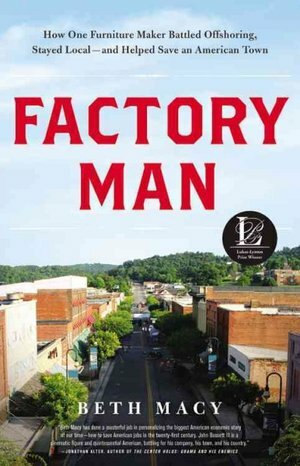 Currently Reading: Factory Man: How One Furniture Maker Battled Offshoring, Stayed Local, and Helped Save an American Town. Factory Man by Beth Macy has nothing to do with fashion, and very little to do with textiles, but it is one of the most interesting and compelling stories I’ve read in a very long time. It’s the story of John Bassett, who despite all odds has managed to keep his furniture business, Vaughn-Bassett, producing in the United States. John Bassett was born into the the Southern furniture business. His grandfather, J.D. Bassett founded Bassett in 1902, and from there the various branches of the Bassett family formed furniture factories all over south-western Virginia. For years the companies were highly successful, even weathering the Great Depression without worker lay-offs. After John Bassett’s grandfather and father died, he was presumed to be the next head of the family business, but instead his brother-in-law was put in charge. In 1982, John Bassett was essentially edged out of his family’s company. He decided to leave and work as the head at Vaughn-Bassett, which was a company owned by his wife’s family. At this point I have to say that keeping all the Bassetts straight was a difficult thing. Thankfully there is a family tree in the back of the book to help keep who owned what in order. Things continued to be fine in the furniture business until the 1990s. At that point, workers began noticing groups of Asian people coming through on tours of the factories. As amazing as it might sound, the factory owners welcomed people from Taiwan and China to come in and observe. In many cases they took notes and even video taped the operations. The furniture makers should not have been surprised when Chinese-made furniture began showing up in the American market. At Vaughn-Bassett, which makes bedroom suites, they noticed a chest that looked very much like what they were making, but that had a price tag of only $100. John Bassett bought one as a sample, had his engineers disassemble it and work up a cost projection. They realized that the cost of the materials far exceeded $100. So Bassett sent his son and an interpreter to China to try and locate the maker of the chest. After days of searching, the factory was located. John himself went to the place to talk with the head of the Chinese factory, and was told point-blank that it was in his best interest to close the US factory and to buy from China, that they could and would continue to undercut American furniture makers until they were forced out. Today this story does not seem to be very surprising, but in the early 1990s, the first ripples of the Chinese way of doing business were just beginning to reach the US. John Bassett went home and studied the trade laws and realized that the Chinese were guilty of a practice called “dumping.” You flood the market with a cheaply priced product until the competition either joins you or folds, then you can raise prices and make a profit. John Bassett then began legal proceedings against the Chinese. It was not easy because he had to get the other bedroom furniture makers to join him, and many were reluctant because they were already involved with importing the cheaper goods. Eventually, the case was won, and Vaughn-Bassett and the other companies who signed on with the complaint were granted millions of dollars in duties that the Chinese were forced to pay in order to continue to do business in the US. Vaughn-Bassett took its share and reinvested it in the company, buying the latest equipment with the aim of becoming more efficient and more competitive. But other companies were not able to survive even with the influx of cash. The original Bassett eventually closed all seven of its US factories. They put their duty money into developing retail stores. Today, Bassett is mainly an importer and retailer. The company survived at the cost of the communities that made Bassett rich. All in all, there have been around 300,000 furniture manufacturing jobs lost in the US since 1990. Today Vaughn-Bassett employs around 700 people, and other companies, mainly makers of upholstered furniture, have also managed to keep domestic production. With the closing of Bassett, the town of Bassett lost much of its infrastructure. Other towns in the area have unemployment rates as high as one third. I’ve heard some know-it-all experts say that America does not need manufacturing jobs as long as we have the design and engineering that goes into manufacturing. Try telling that to a 45 year old man or woman who worked for Bassett for twenty-five years and suddenly found themselves jobless. All the fast food and retail jobs in the world can’t absorb 300,000 workers. The book is very well researched, with what must have been hundreds of hours of interviews conducted by Beth Macy. I was just thinking what a great movie this would make when I read on Macy’s website that a HBO mini-series based on the book is in development. What could have been a pretty dry story instead comes across like a spy novel. The only negative thing I have to note is that Macy can’t resist trying to mimic the Southern Appalachian accent when recalling conversations with John Bassett. It comes across as patronizing. I was given a digital review copy of Factory Man by the publisher, through Net Galley. Just be aware if you read books on Kindle or other e-reader, that there are lots of end notes. In my review copy they were not linked to the text, so accessing them was very inconvenient. There are times in your life when a simple action has a very unexpected effect. When I first called handbag designer Magda Makkay last November I had no idea that I was really gaining a new and treasured friend. But since that day we talk and write, and when I least expect it, a box shows up at my house with her return address. My latest design from Magda is probably my favorite. This is the Bella bag from her Denim Couture line. It is so incredibly well made, and I love the “snake” trim. Inside are pockets and a zippered pouch with a key ring. You can tell from the attention to detail that Magda knows the features that are practical and functional. And the Roxie as well. If any reader would be interested in purchasing a Magda Makkay original, I’ll be happy to pass along her phone number, as Magda does not use the computer. Magda also sent along some photos. Above you have her with Oscar de la Renta at a cocktail party. This is Magda’s daughter, modeling a Magda Makkay handbag sometime in the 1960s. I had the most wonderful birthday in June thanks to you! Getting all the attention and cards from all over! I never had so many birthday cards in my life! So thanks for helping me give my new friend such a nice surprise. Late last year I ran across an interesting Kickstarter campaign. A young hat designer, Satya Twena, was hoping to save one of the last two remaining hat factories in Manhattan. Twena had been working with hats made at the Makins Factory when she heard that the factory was closing. Her business had become dependent on the factory, so she decided to try and save it. She ran a very successful Kickstarter, and the factory is once again up and running. There were dozens and dozens of hats to choose from, but I’m very happy with the one I got. It fits perfectly and looks snappy. The hats are made the old fashioned way using vintage machines and hat blocks. The materials are hand blocked using steam and skill to fashion the shape. I’ve noticed lately that Twena’s company has been getting a lot of press coverage, including Glamour and Lucky magazines, along with the Today Show. If you are interested in a new, top quality hat, there are plenty of styles for sale on the Satya Twena website. 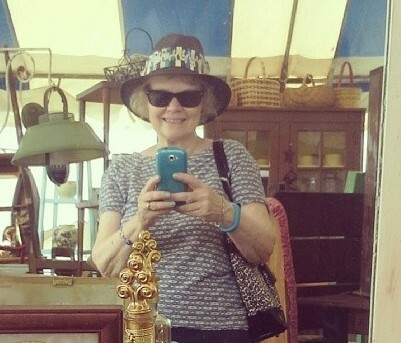 And I even found a photo of me wearing the hat several months ago at the Liberty antiques Festival. I added a scarf for a bit more color. Seriously, I had women stopping me wanting to know where I got the hat. One even tried to buy it!